Indonesian rescue teams on Wednesday struggled to reach remote areas on the western coast of Java amid an "extreme weather" rain warning after a tsunami killed more than 400 people last week. 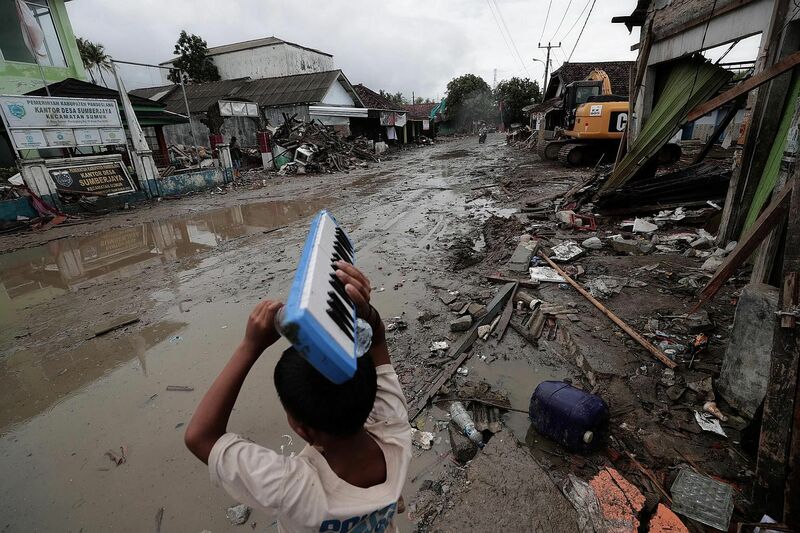 CARITA (BANTEN PROVINCE) - On the 14th anniversary of the Indian Ocean earthquake and tsunami that hit Aceh, Indonesia is reeling from the destruction wreaked by a volcano-triggered tsunami, which killed more than 400 people in Banten province. The coastal villages which bore the wrath of Mother Nature experienced hours of torrential downpours on Wednesday morning (Dec 26), amid fears that continued volcanic eruptions of Anak Krakatau, or "Child of Krakatau", could trigger a new tsunami. An eruption at the rumbling Anak Krakatau volcano in the Sunda Strait had caused a section of the crater to collapse and slide into the ocean, displacing a large volume of water and triggering giant waves as high as 3m last Saturday. On Tuesday, a fresh eruption at the Anak Krakatau volcano sent residents fleeing from coastline areas. Locals and officials alike in Sumur, among the areas worst hit by the tsunami, scrambled for higher ground after hearing a booming sound at about 2.40pm local time. The head of Indonesia's geology agency, Mr Rudi Suhendar, said in a message reply to The Straits Times on Tuesday night that between noon and 6pm on Tuesday, the agency's monitoring post near Anak Krakatau volcano detected continued tremors and recorded boom sounds. The chief of Indonesia's Meteorology, Climatology and Geophysics Agency (BMKG), Ms Dwikorita Karnawati, appealed on Tuesday to residents in the regions around the Sunda Strait to remain vigilant. "This is not to say it's an emergency situation, but... we ask people not to be within 500m or 1km from the beach," said Ms Dwikorita. She warned that the current "extreme weather and high tides", coupled with Anak Krakatau's continued tremors, could potentially trigger another tsunami. Ash from the volcano's continued eruptions fell on Cilegon and parts of Serang in Banten on Wednesday afternoon, blown in by the north-easterly winds, said Dr Sutopo Purwo Nugroho, spokesman for Indonesian's national disaster management agency (BNPB). BNPB appealed to residents to reduce their outdoor activities and advised those who have to go out to wear a mask to avoid breathing problems and glasses to protect their eyes. The latest death toll stood at 430, with 1,495 people injured and another 159 still missing. More than 20,000 people have been moved to safer places, according to an update by the National Disaster Management Agency. Compounding the misery of the coastal villagers, the rains on Wednesday were much heavier than the day before and the high tide and strong waves hampered search and rescue efforts, as well as delayed aid deliveries to isolated villages and evacuation shelters. "Our teams are seeing many broken bones and broken homes, and people who are very shaken," Mr Arifin Hadi, head of disaster management at the Indonesian Red Cross, told Agence France-Presse. "Indonesians have withstood a string of disasters this year, and with them so much loss and misery." The disaster agency said it has dispatched helicopters to drop supplies into a handful of hard-to-reach communities along the coastlines of western Java and south Sumatra. Sergeant Agus Yusuf, a military intelligence officer tasked with keeping order at several villages along the Anyer beach, told The Straits Times that talk of rising sea levels and that the Anak Krakatau volcano may erupt again has caused jitters among the residents. "More residents since last night have panicked. They are worried that sea water could rise again. You can see houses here are temporarily deserted," he said. As this reporter and fellow photojournalist Kelvin Chng travelled along the Anyer beach on Wednesday, we found that many coastal villages which overlooked the Sunda Strait had turned into ghost towns, with residents fleeing their homes for higher ground. A few hundred people were seeking shelter at a guesthouse in the Pasauran village when The Straits Times visited on Wednesday. Former massage therapist Sarinah, 70, goes back to her still intact home once a day to take a shower before returning to the shelter. Asked why she was at the evacuation shelter, she replied: "I don't want to die." Seven-year-old Wati and her family will call the make-shift evacuation shelter home in the coming days, if not weeks. They face an uncertain future because her fisherman father's boat had been badly damaged when giant waves slammed into their village on Saturday. Wati's mother, who identified herself only as Sani, said most of the fishing boats had either broken apart, suffered major cracks or had gone missing. The fishermen have been advised not to venture into the sea amid the rough waves. Survivors told reporters the giant waves struck without warning last Saturday night. The current tsunami warning system put in place after the 2004 disaster was set up to monitor earthquakes, but not undersea landslides and volcanic eruptions. A government agency told the BBC that it will build a new warning system capable of detecting tsunamis caused by undersea landslides. Installation of the new structure of buoys would start next year, Mr Iyan Turyana, a spokesman for the Agency for the Assessment and Application of Technology, told the BBC's Indonesian service. Last Saturday's natural disaster, the third major one after a series of powerful earthquakes on the island of Lombok in July and August and a quake-tsunami in September that killed around 2,200 people in Palu on Sulawesi island, was exacerbated by an abnormally high tide because of the full moon and heavy downpours as the January peak of the rainy season approaches. Fourteen years ago, in 2004, a 9.1-magnitude earthquake in the Indian Ocean off the coast of Aceh struck the province on Boxing Day, unleashing killer waves that left 226,000 dead in Indonesia, India, Thailand and Sri Lanka. Indonesia's Aceh province was the worst-affected region, accounting for more than half of the casualties. Thousands on Wednesday prayed at mass graves and mosques in the province to mark the 14th anniversary of that Boxing Day tsunami.